We live on a rock bobbing gently in a dark sea, a rock swimming unceasingly around a ball of fire. The stone that our home is made of is enduring and mysterious. As it travels, we travel with it, even when we stand completely still. Some of us love our stone home, and appreciate its gifts by trying to give back as much as we take. Some of us use it simply for its resources and continue to ungraciously take more than it can offer. Things made of stone represent permanence. Something made of stone can be relied on. The reason I am thinking so much of rocks and stones is that our guide on our Dokdo trip (August 24-27, 2013) with Isabu Academy told us a story of rocks and stones that inspired me and changed my perspective about the Korean island of Dokdo. Our guide, Han Dongwan, is knowledgeable about foreign and international politics. 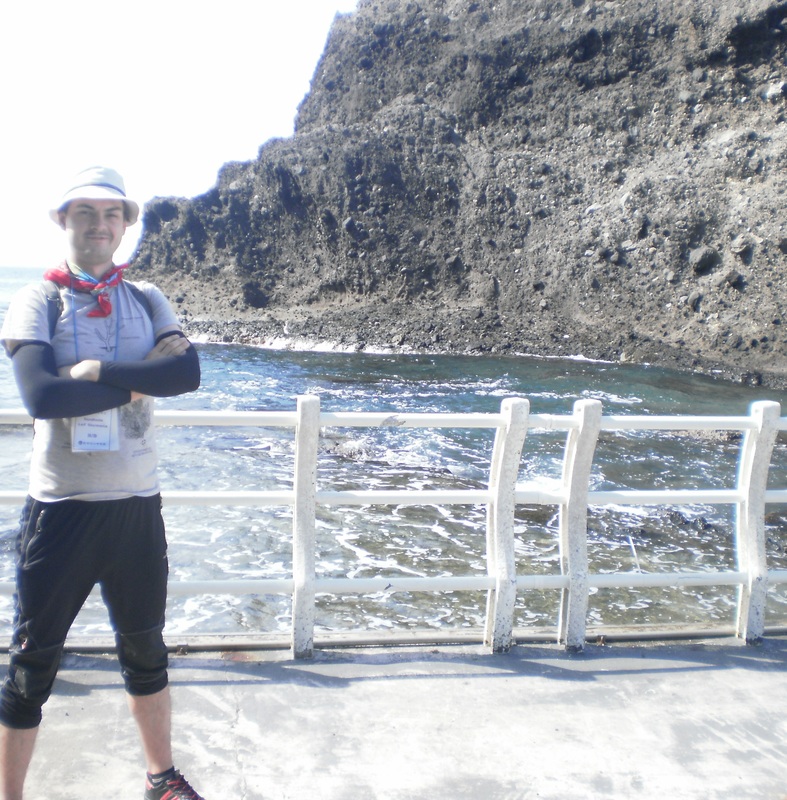 He is also a cyclist and knows much about bicycle routes throughout Korea. Our tour bus stopped at a site on the island of Ulleongdo near a pagoda and a few freestanding rocks. Throughout the trip we had been learning about igneous rocks, granite in particular—the kind of rock that could be found forming natural archways along the shore. We learned about how volcanic magma flows created the curious cliffs and various erratics surrounding us on our journey. Where we stopped, there were two important natural sculptures: Lion’s Rock and Helmet Summit. 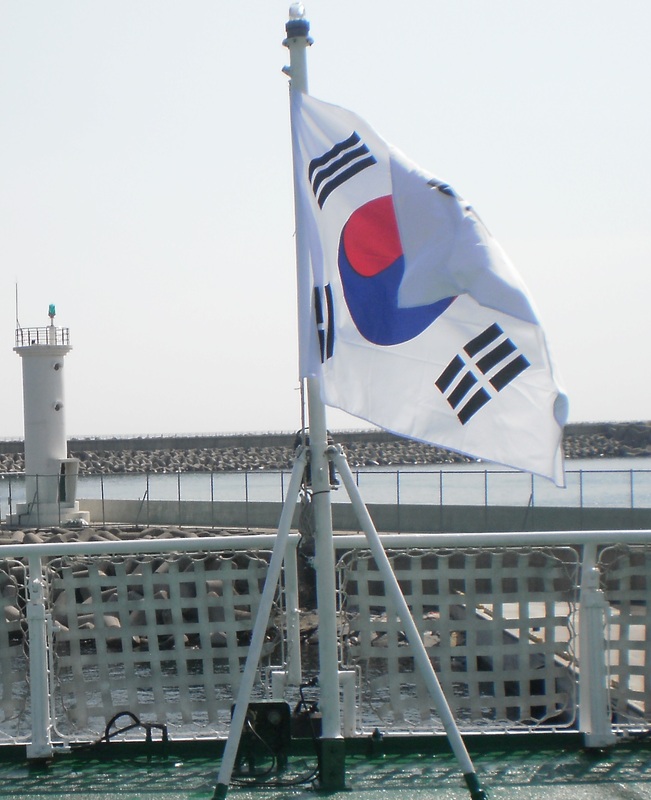 This story begins with the people of Usan-guk, an area comprised of Ulleongdo and Dokdo. Their leader decided to lay siege to an island near Jeju-do. From this island, the king took off with a beautiful princess and returned from his victory, proud to have taken for a queen the most astounding beauty of the East Sea. Due to her dazzling desirability, the queen was able to acquire anything from the lascivious ruler whose passion for the queen, burning brighter with each day, bound him to being unable to refuse her a single gift. As the royal coffers emptied and the king’s army and citizens suffered, the king had no choice but to aggressively invade every kingdom within his reach. Driven to war by the queen’s endless requests and the king’s desire to fulfill them, the army became an aggressive force, though it is said they were not particularly intelligent. The queen died and the king fled to the hills to sing of his sorrow. This is the pretext of the region General Isabu came to annex in the 13th year of Silla King Jijeung, which we date AD 512. General Isabu’s first conquest against the rowdy, uneducated followers of the lusty king was a failure. It was not until a second attempt that the general would set a precedent for future triumphs of cunning such as General Yi Sun Shin’s famous attack formation and invention of the Turtle Ship and King Sejong’s restructuring of Joseon’s cultural and innovative landscape by fostering technology, invention and the creation of the Hangul writing system. The general planned his attack intelligently and creatively. He ordered his best carvers to create wooden statues of lions. He assumed the rough, starving warriors would be subject to the hallucination that the lions were real. He then sailed by Usan-guk, where he told the dumbfounded soldiers that he would release his lions if those brutish islanders failed to comply with Shilla’s demands for annexation. Whether the soldiers truly believed the general, or they were simply fed up with the lascivious king and his selfish excesses, the citizens of Usan-guk yielded to the ruse and Usan territory was now under the dominion of Silla. Helmet Summit represents the king’s pitched headgear, and Lion Rock represents General Isabu’s clever plot. Once the story was finished, there was talk in our tour group that another rock formed the likeness of the dead queen, but this remains unverified by the Koreans we have spoken to about this subject. Let me tell you a little about our tour group. We came from Jeolla-do, where it is said that you can find some of Korea’s best food, including delicious dolsot bibimbap, which is served in a stone bowl. But the residents of Jeolla-do have not always been so fortunate to have an abundance of delicious food. There was a time in our region that many impoverished Jeolla residents embarked on an exodus to the former Usan territory. They named the small, beautiful island they found in the East Sea, Dokdo. 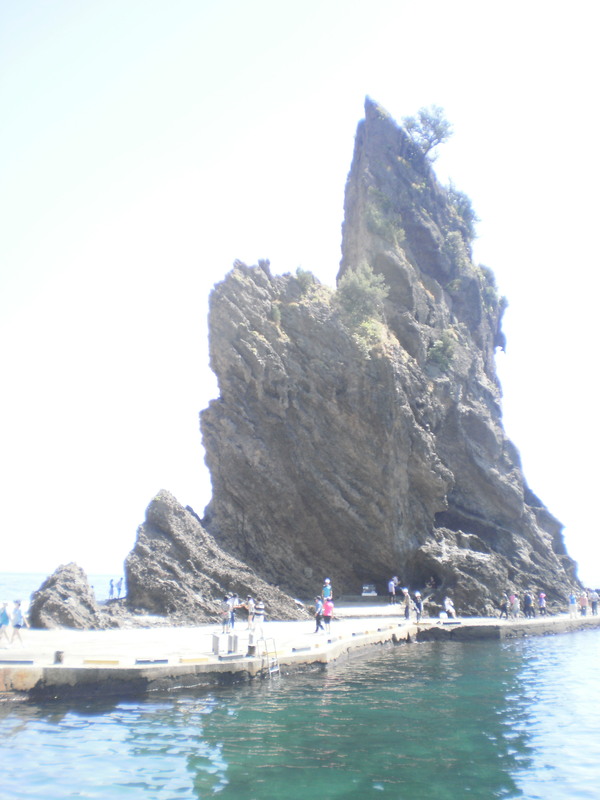 In Jeolla satori, or dialect, stone was pronounced dok instead of dol, hence the name, Dokdo—the stone island. The Japanese, prior to calling the island Takeshima, called it an island of wood, Jukjo, from the word for bamboo. On Monday, we saw the island with our own eyes. The only wood on the island is the wood that was brought to Dokdo to construct a narrow staircase to the top of the igneous slope. Wood is a natural resource, something to be harvested and used. This is another side to this tale of wood and stone. For our entire trip I had the chance to see Dokdo as an island of stone—something enduring, reliable, and central to the foundation of Korea. I have seen the island portrayed as something unmovable, grave, and monumental through dozens of creative projects on this tour: stories, carved wooden lions, and a 3D animation of the whole island, to name only a few. I had forgotten that to some it might not be an island of permanence and monument, but a territory rich with resources and benefits such as fishing waters, passageways, national borders and regions for strategic military use. If Dokdo is an island of wood, it is not representative of history, but convenient for the moment; it is not a site of traditions, stories and beauty, but a possession to be obtained. In my three years of living and teaching in Korea I have heard the voices of students, teachers, families and friends whose adoration was directed to the East Sea, to this pristine, beautiful island. But I have not heard the perspectives of those in nations who have recently decided they want to take control of the island for its resources. I do not know if they talk about it, construct museums dedicated to it or invest as much love and care into study and education about it as the Koreans I have spoken with do. I wonder if the kinds of pictures of Dokdo I see on billboards, in museums and framed in homes in Korea are, in another country, kept in offices, hidden in file folders marked “land acquisition”. Finally, I wonder: Do you know Dokdo? For you, is it an island of wood, or an island of stone?